Amazon founder and CEO Jeff Bezos may be the richest person on Earth, but he still has to follow the rules like everyone else. Bezos just found that out the hard way when he was fired from Amazon for getting a tattoo. Sorry, Jeff, but rules are rules. Just because you have $156 billion doesn’t mean you can do whatever you want. The firing went down yesterday, when Bezos arrived for work at Amazon’s Seattle headquarters sporting a large, freshly inked tattoo of Pegasus on his neck and face, which, though tastefully done, was in clear violation of the company’s policy on visible skin art. He was immediately pulled aside by two HR managers, who informed him that, as an employee who often interacts with important clients and investors, they felt that his tattoo gave him an unprofessional appearance that would hinder his ability to effectively represent the company moving forward. They added that had Bezos gotten a small tattoo on his arm or lower back that could be covered up by clothing, perhaps Amazon could have looked the other way, but the reality is that his new tattoo is enormous and goes way above his shirt collar, making it impossible not to notice. After the company informed him that his employment was being terminated, Bezos was given only half an hour to pack his personal effects into a cardboard box before security escorted him out of the building. It’s harsh, but to be fair, Bezos was fully aware of the company’s no-visible-tattoos policy yet still decided to get inked up anyway. 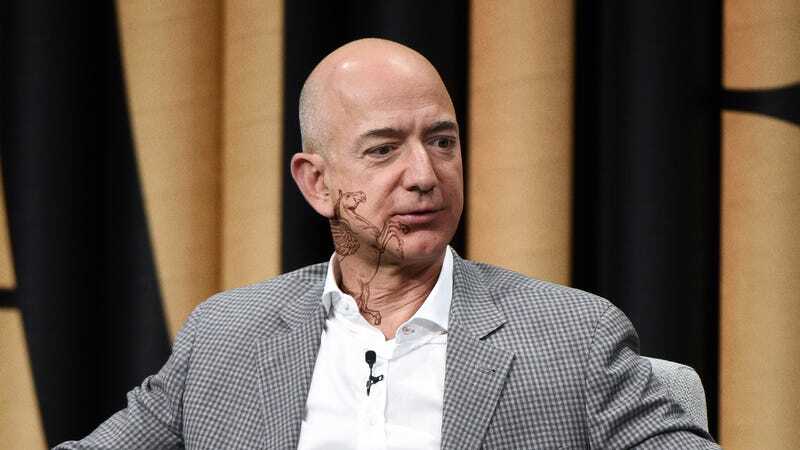 Bezos is going to have to dust off his résumé and look for another job, but it might be hard for him to find new work now that he has a huge tattoo covering his neck and face. You can’t help but feel sorry for the guy, but by violating Amazon’s rules on tattoos he completely brought this on himself.